Holts Landing State Park is located in Millville, Delaware. Located on the Indian River Bay, the park is modest in size, ranging about 200 acres. However, there are several unique areas within that distance including wooded areas, grassy areas, and a beach. 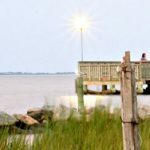 The park offers a variety of activities, including one of the best crabbing piers in the area. Here is a guide to some of the things you can look for and do at this great state park. Holts Landing State Park has designated hours where it is open to the public. The hours are usually 8 AM until sunset. Therefore, it’s not a park geared toward campers. However, you can still spend the day doing a variety of other activities. The most popular draw for visitors is the crabbing pier. The pier was about ten years ago in an effort to give crabbers access to the large number of blue grabs in the bay area. There is plenty of room on the pier to support a large number of crabbers. If you’d rather fish, that is an option too. Fishing can be done from the pier or the surrounding areas. The bay is home to a variety of seasonal fish, including trout, flounder, and clams. Fishing is permitted during park hours as long as it is within season. In addition to angling from the pier and other areas, fishing from boats is also popular. Aside from fishing and crabbing, recreational boating is also popular at Holts Landing State Park. There is a boat ramp that can launch both fishing and recreational boats. Most motorboats are prohibited due to shallow waters, however kayaking is very popular in the canal areas. Boating restrictions are available by contacting the state park. It is important to be aware of what boats are allowed in what areas. Holts Landing also features a privately owned marina with docking available. Aside from fishing and boating, there is a lot more to do at Holts Landing State Park. The park has several nice picnic areas located throughout the park. You can use the tables, grills, and bathroom facilities for your family picnic or rent a large pavilion for group and corporate outings. Depending on the picnic area you choose, you can get a nice view of the bay or wooded areas. To add to the fun, there is a playground as well as horseshoe pits. If you enjoy hiking, Holts Landing State Park has a great trail system. There are trails for both hiking and horseback riding. The park is home to a lot of wildlife including foxes, deer, possums, and a large variety of birds. Different trails will provide hikers with the opportunity to see these animals. In addition, the park is home to natural ponds that are inhabited by freshwater fish and plants. The reason hiking is so popular at Holts Landing is the variety of terrain. From the sandy areas around bay to the grassy areas to the forest areas, there is a lot to see on the hiking trails. The trails aren’t physically grueling but you can get some exercise in while exploring them. Horseback riding is permitted on designated trials, offering people another way to enjoy the park. If you just want a casual walk, the trail along the water offers many great views of the bay. While camping is not available at the park, it shouldn’t deter outdoorsmen from visiting. The park is small compared to many other parks but offers a lot of charming areas. There is a lot of natural scenery to enjoy in the various park areas. In addition, crabbing can be something different that many parks don’t offer. It is fairly easy to learn and a great way to spend the day at the park. The fields in the park allow you to play football, baseball, or any other recreational game you want. It’s a great way to enjoy a no cost day with friend and family. If that isn’t your thing, you can also get good exercise on the hiking trails or simply explore the natural areas of the park.